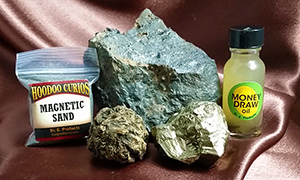 Reviews: Extra Large Money Draw Spell Kit (Prosperity Lodestone) Extra Large Money Draw Spell Kit (Prosperity Lodestone)  - $70.00 : ConjureDoctor.com - Home of Dr. E. Hoodoo Products and Magical Services, Get What You Want! I've been working with this team for years and can say everything they do and touch is blessed and amazing, so you can buy with confidence. They have rare talent, spiritual power, knowledge, professionalism and caring. But I wanted to share my experience this week with the Money Draw Lodestone kit. It arrived last week and the directions are very clear and easy. I did as instructed and then next day I won a new project. The day after that, more money, more projects. I went back and prayed that I win something long-term that is in line with my genuine passions. Boom, won that business today! I am not kidding, the magic is real, this is real, believe and ye shall receive. Blessings to the team and everyone around them. -R.B. Date Added: 09/28/2014 by R. K.